In recent years I have been trying to eat healthier and feed my family healthier foods. I try to fit more veggies in our diet. I have found that steaming them locks in their beautiful color and less nutrients are lost. Not to mention that the food that you steam tastes fresh and so good. I was recently given the opportunity to try out the Vegetable Steamer Basket Complete Bundle by Kitchen Deluxe. There are several things that I really like about this steamer basket. First of all the design makes it usable in almost any pot,it opens like a "water lily" and closes up so small for easy storage. I have tried the bamboo steamer racks and I just don't have enough space to store them. 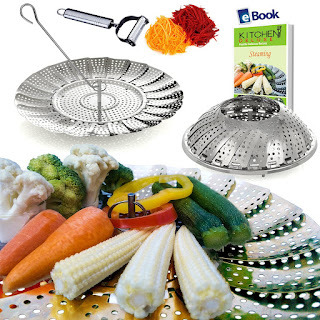 This steamer basket comes with a hook handle that makes removing the basket from the pan easy. This steamer is well made and dishwasher safe. It's made from rust proof stainless steel. It comes assembled and ready to use. Also there is an ultra sharp jullienne vegetable peeler slicer included. Makes peeling fruits and veggies so easy and fast. This steamer is great for busy moms, college students,home cook culinary artists. This steamer isn't limited just to veggies. You can use it to steam fruits, make baby food, seafood, tamales, Asian dumplings, rice. The only limit is your imagination. If you are looking to eat healthier, this is a great way to achieve your goal. This steamer is a great companion to many of the diets out there such as Weight Watchers, Great Food Fast, South Beach Diet, and Atkins. Steaming is one of my favorite ways to cook veggies. It is so simple and flavorful. I used this many times, easy to use. That would be something I could use. Thanks for the review.